The Byre built in 1886, has been creatively refurbished into a cosy, homely cottage. Enjoy the evening sun on the patio in the colourful garden with fruit trees. Set in the crofting village of Kilchoan it is a short walk from a friendly, local pub, shop, tearoom and regular ferry sailings to Tobermory, on the Isle of Mull. The Byre is a very cosy, comfortable cottage in a beautiful location. The Wood burning stove was perfect for cosy evenings after the very few rainy days. John and Jacqui were great hosts. Thanks a lot for the heartly welcome and for all your value advices. We had a great time at the Byre and have enjoyed every day. We stayed for a few days at the Byre - just enough to see some of the main highlights - Ardnamurchan lighhouse, Sanna beach, Glenborrodale, Ben Hiant. Only had one rainy day out of three, which cleared up later on. The cottage is very comfortable for two, with a wood burning stove and freeview TV. We had a nice welcome from Jacqui and John. Kilchoan is a in a good location with the ferry to Mull. If you are lucky with the weather (!) it is a great place to visit. Really enjoyed our stay. Byre was quirky and well-organised. John and Jacqui are great hosts. To be recommended! We had a great time at The Byre. Near the end of the most twisting, narrow, but beautiful road you can imagine, miles from anywhere. Lovely welcome from John and Jackie, the log stove lit with smoke coming out of the chimney made us feel at home straight away. 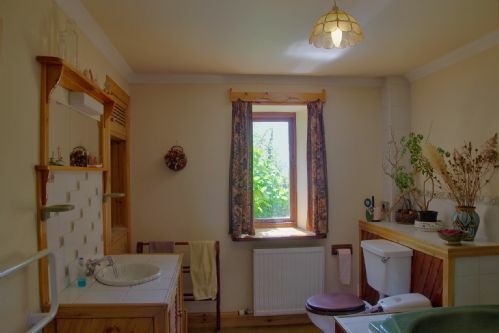 Lovely cottage, the limited headroom in the bedroom, and the shower, take a bit of getting used to, but the sense of peace and being away from it all make up. If you don't like being away from everything, there is TV, video, and broadband:- and only a mile from the ferry to Tobermory. Book the boat trip to Lunga and Staffa, take the car to Tobermory, drive to the other end of Mull and visit Iona - there and back in the day is easily possible. And make sure you go to Sanna beach - one of the most beautiful and empty beaches we've ever seen. Don't panic about the weather or the midges - weather was fantastic and it was too breezy for midges! Limited - shop and hotel / pub are fine, the Community Centre is good.But Meall Mo Chridhe - a restaurant we found reviewed, and Sonachan Cafe Bar, a local pub - are both permanantly closed, and Mingarry Castle is not open to non-residents. But you are only a mile from the Tobermory ferry, plenty of facilities there. We absolutely loved our stay at the Byre. It was cosy, comfortable and very peaceful. Being woken by sheep was a far cry from city living! The Byre had everything we needed, including a bath the size of a swimming pool, and a beautiful sun trap garden with stunning views. Seeing the seals out in the bay John directed us to was a highlight! We'd happily recommend it to anyone wanting a quiet time away. Lovely and laid back. The pub was fantastic, and the ladies at the community centre were lovely. Fantastic weekend in a fantastic location. The byre was perfect for our needs, hopefully we'll be back soon. We were met on arrival and shown where everything was and how it all worked. The interior is a little work of art. Managed to forget a watch when we left. A quick call and it was found and dispatched straight away. Terrific service. Everything promised and more, plus a view of the sea. We so enjoyed our stay at The Byre — one-of-a-kind charm, cozy and comfortable. The view out the front window was wonderful — we watched the changing light over the water even when it was drizzly, warm and snug by the wood stove. A nice young couple was in charge of the property while the owners were away, and they tried diligently, but couldn't help us figure out the heat in the bathroom on a cool night. But we managed all right. The only other drawback was not realizing that there'd be nowhere to buy supplies in Kilchoan (coffee, breakfast things) when we arrived in late afternoon - the only shop keeps somewhat irregular hours, and closed before 5:00 p.m. We made the best of it with a very good dinner at the hotel, and went back for breakfast, then walked the few blocks into town to the shop once it opened. A highlight was having a bag of veggies and apples from West Ardnamurchan Community Garden left for us, and another day Kirstie, the baker from Kilchoan Bakery, delivered a loaf of sourdough to us. Beautiful part of the world — loved our visit to San Beach and Ardnamurchan Point lighthouse. Perfectly adequate, but wish we had known to bring the first day's supplies with us! Lovely accommodation in a beautiful location. We had a great time and wished that we could have stayed for longer. The local shop is very well stocked. A visit to the lighthouse is a must and there is a lovely cafe there too. The food at the Kilchoan Hotel was excellent and the staff were very welcoming. The hotel is only a short walk from The Byre. I will recommend The Byre to my friends and family. The local shop has everything you need. The food at the Kilchoan Hotel was excellent. "Home" Here I felt very comfortable. Jaqui and John had welcomed me on arrival very warmly. Always I got answers about the resort or Notes to others Subjects. "It was a really good time for me!" Thank You! Oh, sure! First I am a family member and then also my work colleague of it report and gladly recommend! It was ok. A notethat anyone who is on holiday in Kilchoan, needs a car is important again. Fantastic property, great owners and wonderful location! Couldn't fault this place. It was just great. The property had everything you would need - a home away from home. John and Jacqui were just fantastic. Great - all that we needed. The Byre is an excellent well appointed and comfortable property. It is well situated for a relaxing get away from it all break, and a good base to explore the Ardnamurchan peninsula from. The managers, John and Jacqui, are extremely friendly and helpful hosts, with a wealth of knowledge of the surrounding area. The Byre was a little gem for me. I felt relaxed straight away after being welcomed by John. I found him to be authentic and with a sense of humour which I appreciate. I got a real sense of day to day life in Kilchoan by chatting with John and Jacqui. Jacqui was really helpful in giving me information about walks and I could tell that it's important to her that they continually update their service and improve on customer experience. They put a lot of effort and heart into their family business. This was my 5th time staying around Ardnamurchan and I would recommend Steading and this location to anyone who is wanting a real remote, warm and friendly experience of Scotland. We love the wild beauty of Ardnamurchan and the Byre suited us well as a place to stay. It was idea for two. Warm - especially with the wood burner - and comfortable. Good too for us that it was dog friendly. The Byre is equipped with everything that you need to have a relaxing self catered holiday. The bathroom in huge and the bath is too making it very easy to relax in. The sofa is very comfy and the view from the living room window is beautiful. The bed is bigger than mine at home and lovely and soft. The log burner was perfect for a cosy night in watching films and was very effective at keeping the place warm and snuggly. The garden to the front, side and rear is beautiful and in keeping with the style of the property, with apple trees and a stream running through and little bridges dotted around. John and Jacqui were very welcoming and helpful but also left you alone to do your own thing, but i always knew they were there if i needed them for any info, advice or help. The area is beautiful, there isn't much to spend your money on, so no shops really or activities but there are so many beautiful walks and historical places to visit and so much natural beauty we certainly were never without something to do and see. The ferry to Tobermory was a great day out too. I have already recommended Kilchoan and Steading cottages to my parents, sister and friends. The shop was stocked with everything you could need including the post office for cash withdrawals. The shop also had a petrol and diesel pump. The hotel had a nice atmosphere and we enjoyed a meal out there and were able to take our dog too. Kilchoan is a good base for holidays in West Ardnamurchan and the Byre is an ideal cottage for two. Well equipped and all appliances functioning. Benefits from an off-road parking space and own private patio to catch the late afternoon sun. The wood burning fire in the living room adds a cosy touch. Bedroom is well kitted out but a little on the small side and accessed via a steep spiral staircase which may be unsuitable for elderly or infirm. Otherwise an excellent property and well worth the drive from Strontian. Plenty of walking and sight-seeing close by and quiet at night which allows sleeping with window wide open at night. Also easy access to the Mull Ferry (about 15 minutes walk). Hosts John and Jacqui have been in the area for many years and are very helpful and accessible (they live in the attached house). The Byre was a fabulous cottage, so comfortable with John and Jackie being so helpful and generous. We had a very relaxing week with all the home comforts you could wish, would stay there again on next visit to Ardnamurchan. Very good, Kilchoan is a very good location. We spend a pleasent stay in Kilchoan. The house was leasure, well equipped and the host was very gentle and helpful. The location is quite close to the ferry harbour to Tobermory, so that you can visit Mull. Furthermore you can book a tour to Staffa and Lunga, which starts in Kilchoan. The accommodation has a nice atmosphere and a great view to the sound of Mull. Thank you very much! It was ok and the way we expected. Comfortable, cosy, well-designed and well-located. The Byre is ideal for exploring the Ardnamurchan peninsula - and then returning to a cosy, modern base surrounded by nature. The hosts are welcoming and willingly provide local knowledge. The Byre is equipped with everything that you may need. A very enjoyable stay. Nice pub with friendly service and good food. Adequate local shop. Fun ferry trip to supermarket. We loved the byre- a beautiful and well-equipped place to stay, and really well located for exploring West Ardnamurchan. Really appreciated the views to Mull too. Thanks for making us feel so welcome. Though a little difficult to find (we arrived in the dark! ), we were greeted by John who instantly made us welcome. We were shown to The Byre where the lit woodburner and gentle lighting invited us in. We were in Kilchoan, Ardnamurchan to enjoy it's beauty and to photograph it! We wanted cosy, comfortable and affordable accommodation and that's exactly what we got. We didn't travel to the most westerly point in the UK to dine out and dress up so if those things or minimalistic, contemporary styling is important to you, then you'd not be happy here! We were extremely lucky with the weather. Sanna Bay is stunning ... For us, The Byre provided a perfect base for exploration. We booked 'The Byre' on very short notice over New Years Eve. We had been tempted by the oven and the so individualistically decorated interior. Due to the weather conditions, Jacqui even called me the day before the trip to give me very helpful advice on the roads and conditions. When we arrived, a fire was already set up in the oven. John knocked later on checking if everything would be ok. Wonderful Jacqui and John live in the house next door, so if you have any questions, you just pop into the shop selling crafts...and if you have forgotten your jam, candles, or want to write some postcards...We enjoyed the oven, the well equipped kitchen, and the space....the garden is a beautiful mix of un/arrangements, and you can see the gardener enjoy nature. If we wouldn't be new to the country, and there would be so much to see still, we definitely would come back! We received a warm welcome in more ways than one at The Byre as the managers, John and Jacqui, both came to meet us and John had lit the excellent Squirrel stove which was very welcome after a long and wet and windy drive. The cottage is comfortable and cosy and despite being attached to the Steading Holidays office and shop is very private and peaceful surrounded by a garden and view of the sea from the bedroom and lounge. It is ideally situated as there is a well stocked 'tardis' shop and a pub in the village where you can enjoy a bar meal if you don't feel like cooking. You can also take a short ferry journey from Kilchoan across to Tobermory on Mull but we found there was plenty to enjoy in that area of the Ardnamurchan peninsula if you enjoy walking, lovely scenery and opportunity to see a Golden or Sea Eagle, such as we did. All in all, a lovely holiday at The Byre. Good food at the Kilchoan hotel and a well stocked shop with fuel pump, all on the doorstep. Lovely warm and welcoming cottage looking out over Mull. Murphy, the owners cat, is an absolute delight. I would thoroughly recommend The Byre for a quiet relaxing holiday. Good local shop, ferry to Tobermory 1 mile away. Lovely cosy house, very welcoming, comfortable and spacious. By far our favourite holiday "cottage" of all we've stayed in. We enjoyed a very warm welcome from John who was full of useful information about the house and the area. Lovely location and very friendly host. The overall decoration was very dated and in meed of upgrading. There was very limited headroom in the bedroom which meant that you could not even walk round the bed without stooping. There was virtually no clothing storage at all. The bathroom lacked a standing shower. The wood burner in the living space was very efficient at keeping the room lovely and warm. The local shop was very good with most things you might need. The Kilchoan Hotel on the other hand offered very poor meals. John was a fantastic host, nothing was too much trouble. It was our first visit and it won't be our last. Most wonderful and beautiful part of the UK. Even our dogs loved it, they have been abit grumpy since we got back (lol). Would recommend to everyone that reads this review, add this to your bucket list guys you won't regret it. I spent a very happy, comfortable and cosy five days in the Byre. The wood burning stove gives a glorious heat which drifts up to the bedroom and makes that very cosy too! It's in an excellent location - handy for the ferry to Tobermory, the beaches at Sanna and Portuairk, Ardnamurchan Lighthouse, walks, the local hotel and Kilchoan village store/petrol pump. John and Jacqui are delightful, friendly and helpful hosts. A perfect place to get away from it all and recharge my batteries! Lovely cafe at the Lighthouse, village store in Kilchoan quite well stocked. Didn't visit either local hotel this time, so can't comment on those. We had a wonderful time at The Byre. The owners were very helpful. The cottage is cosy and the location just perfect. The wood burner created a fantastic atmosphere every nights. We will visit this place again. An ideal location for adventure or isolation, learning a new skill or just relax & take in the peace & tranquility in the warmth & comfort that is The Byre. Easy to use stove for cosy nights in, wifi, tv & dvd & the biggest bath to ease the aches of a long hill walk or just chill in with a book & a glass of wine. John & Jacqui were very friendly & helpful giving fishing tips & walking advice, having them on hand in case of emergency is a bonus too, not that we needed them but it's nice to know they are there. Ardnamurchan is the perfect place for a peaceful holiday. The Byre is well situated for the local amenities. We unfortunately had cold weather but the wood burning stove and the ample fuel provided kept us really cosy. John & Jacqui are very friendly and helpful and are are always there if you need them. The bed is really comfortable. We had a wonderful week. The Byre is conveniently situated within easy walking distance of the amazingly well-stocked Ferry Stores. The Kilchoan Hotel is even closer and the bar meals are excellent. The ferry to beautiful Tobermory is also within easy walking distance. Enjoyed our week in the Byre and Ardnamurchan. Made very welcome by John and and Jaqui. The Byre had everything we needed and especially the wood burning stove. This is a great area to explore with lots to see and do. Great to visit Tobermory on the ferry did this twice. Can't wait to return. Arrived Sunday evening in April - all fine although we had a minor problem with the lights/fuse board which was resolved quickly after couple of phone calls. Log burner excellent and needed as weather became typically Scottish on the Tuesday. Overall the Byre was a good holiday experience. Local facilities were limited. We didn't use local shop or fuel supply. One hotel that we tried for lunch - Open all day signs showing - advised us that they were in process of changing ownership and were closed for lunches. Another hotel we tried for dinner was OK. Food was fine but nothing special. Great place to unwind and relax. Fantastic scenery and very nice people. Our second trip within 8 months and we will be back again. John and Jacqui are very helpful, accommodating and most of all friendly. Great pub and hotel plus a well stocked shop. All we were looking for and all we needed. Plenty to do if you like the outdoors. Especially good if you have a dog. Perfect location to get away for a while from the pressures we take for granted in the modern world - Byre cottage is comfortable and well set up with everything you need . John and Jacqui chappel were very helpful and friendly and also respected our privacy. The ferry to mull is walking distance from the cottage as is the very useful local shop for newspapers and everything else you need. Had a bonus of seeing a fantastic show from the local dolphins alongside the ferry on our crossing to Tobermory, P.S. The Squirrel log burning stove was great and very comforting on cooler evenings. Local shop excellent . Tourist information and cafe poor facilities outside for anyone with a dog. how many superlatives can one use ? wonderful cottage for 2 , beautifully but cosily appointed, fantastic log burner used in evening although we didn't really need it. superb sea view from both lounge and bedroom windows, lovely to lay in bed looking at the water. And yes we were really lucky with teh weather, but would not have minded being rained in by teh fire reading. John and Jacqui are natural hosts as well, just hope we can get back there sometime. more than adequate village store by the jetty, and the local pub is friendly, it does food but we didn't partake. ferry to Tobermory is a good half day out and there's a superb sandy beach that goes on for miles 5 iles away at Sanna, which is a beautiful walk from the Byre if you're walkers , or it's an easy but single lane drive (lots of passing places) with free car park about 300 yards from teh beach across dunes, take a picnic though as there are no shops etc. However if you are after a loud nightlife as well, this isn't for you, but the pub possibly puts on muic, didn't bother to check. The Byre is a comfortable, well situated cottage with a pleasant garden. Lovely to have views of the sea from the bedroom and to be so close to so much beautiful scenery. Jackie and John are very welcoming and helpful without being intrusive. Like most guests we enjoyed the wood burning stove. We had some very nice trips out to Tobermory and a wildlife cruise as well as some great local walks, cycle rides etc. Definitely suitable for people wanting a peaceful break. The single track road takes a bit of getting used to but it’s all part of being in such a remote place. Would definitely recommend the Byre. The local shop was very convenient. Great having the ferry to Tobermory. Home from home. Everything you could wish for was provided. Log fire every night a dream end to the day. Would recommend Steading Cottages very highly. Lovely Garden to relax in. All in all an extremely relaxing holiday location, with no noise what so ever. Comfy and Cosy little place in an excellent location. We had a great few days staying at the Byre and exploring the local area. Would recommend it to anyone! The Byre itself is very comfortable and well equipped. The fire was lit for our arrival and the place was cosy and warm. We look forward to another visit! The Byre, Kilchoan. Scotland at its best! We booked The Byre last minute and we arrived later than expected which was no problem at all. Kilchoan is beautiful, as is the area and The Byre is no different. It's even better than the pictures. The open fire was a delight and we had plenty of peat to keep it going all night. The bedroom was gorgeous with amazing views and an exceptionally comfortable bed. The kitchen is well stocked but if we could not find something we needed we were told to just pop next door and ask for anything. Oh and the bathroom is just fantastic, I ran a lovely hot bath in the HUGE bath tub, it was so relaxing. The Byre is one of the nicest places we have stayed, the owners really care about their property and that you enjoy your stay and we really appreciated that. We decided to go to the local pub at the Kilchoan Hotel and as it was pitch black with no street lights, we asked for a torch which was no problem at all. The pub is great and we had a lovely evening talking to the bar staff and other locals who were enjoying a pint, hugely friendly environment and fun times were had by all. This was the second time we've stayed at the Byre, it's a perfect cosy cottage for two in a great location. Ardnamurchan is very remote and quiet, bursting with natural life at every turn, Kilchoan has just enough civilisation to add the little extras. The Byre is a two minute walk from the friendly pub (that also does good food), a ten minute walk from the ferry stores and a ten/fifteen minute walk from the ferry to Tobermory. The Steading has a great feel to it with the vegetable gardens, fruit trees, streams, winding paths and even a litter of pigs on the hill. John and Jackie are always helpful and full of ideas and places to visit and their craft shop is next door to the Byre - their complimentary handmade jams are a delight. The facilities are basic but more than adequate, if you're after 4 star accommodation then the Ardnamurchan experience is the wrong holiday for you; the crofting and community spirit lives on, we ordered a fresh seasonal vegetable bag from the community garden (at which you can volunteer one day a week) and it was delicious. If you read the visitor book everyone mentions the wood burning stove, sounds odd until you've used it. Within minutes you have a great fire going and the place is as warm as toast, the only problem is that after a day out in the hills or on the beaches you'll be fast asleep on the sofa in no time.